Brooks: "As a past chief of the Seaford Fire Department, I’m well aware of the day to day risks facing our volunteer firefighters." Senator John E. Brooks standing with fellow volunteer firefighters. Long Island, NY - September 27, 2017 - Senator John E. Brooks stood with fellow volunteer firefighters today to call on the Governor to support presumptive cancer coverage for New York State’s volunteer firefighters. Currently, New York volunteer firefighters with a cancer diagnosis face escalating medical bills and the possibility of lost wages as they become increasingly sicker. While New York’s career firefighters have presumptive cancer coverage, there is no formal safety net in place now to help the volunteer firefighters when they need it most. Firefighters are significantly more likely to develop many types of cancer than the general population, beyond lung cancer, largely due to the high levels of carcinogens and other toxins found in burning buildings and hazardous environments. Dangerous byproducts of combustion firefighters face in every fire include many chemicals and toxins absorbed directly through the skin. Even soot is a Group Carcinogen, and is on the list of the worst possible carcinogenic offenders according to the International Agency on Research for Cancer. The bill expands existing coverage under the Volunteer Firefighter Benefit Law to include cancer of the digestive, hematological, lymphatic, urinary, prostate, neurological, breast and reproductive systems. Exposure to smoke and toxic fumes through volunteer firefighting creates a greater risk of cancer in many other parts of the body as well as the lungs; this bill attempts to cover the various bodily systems at risk due to toxic exposure. 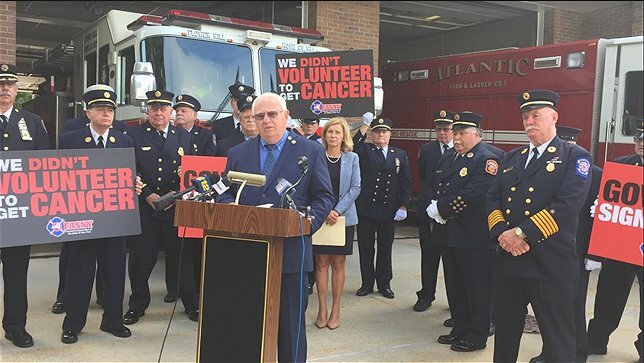 Subject: LongIsland.com - Your Name sent you Article details of "Senator John E. Brooks Calls On Governor To Support Presumptive Cancer Coverage For NYS Volunteer Firefighters"